Luxurious and therapeutic, with a dose of daily relaxation, residential steam showers allow you to indulge in spa-like retreats within the comfort of your own home. For this luxury to last, it is important that the tile installation is well-protected against moisture. Water exists in both liquid and vapor forms, so steam showers need to be able to manage both to avoid mold growing in wall cavities, wood framing from rotting, and damage to occur in moisture-sensitive wall coverings on the opposite side of stud cavities. Steam showers tend to be challenging areas to waterproof since they present extreme conditions, with high levels of heat, steam, and moisture. Here are two waterproofing options that are ideal for your residential steam shower: KERDI-BOARD and KERDI – both provide waterproofing as well as being vapor retardant for effective moisture management. 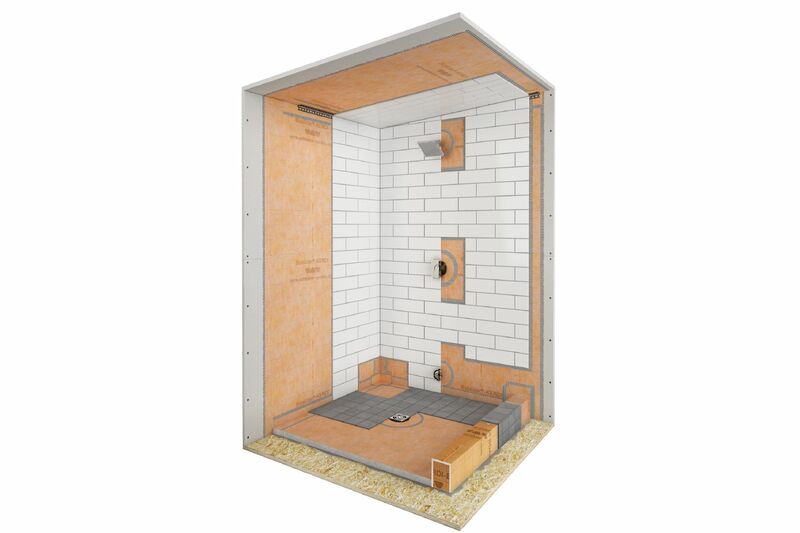 In this residential steam shower, KERDI-BOARD is fastened to wood studs instead of drywall or cement board to provide a waterproof construction. 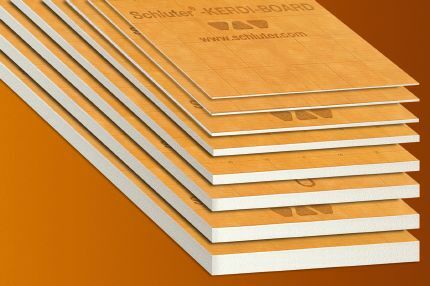 KERDI-BOARD is a multifunctional tile substrate and building panel, which can also be used for creating bonded waterproofing assemblies with tile coverings. It consists of an extruded polystyrene foam panel, with a special reinforcement material on both sides and fleece webbing for effective anchoring in thin-set mortar. In steam showers, ceilings must be waterproofed, and are sloped to avoid condensation from dripping on occupants. You can install KERDI-BOARD directly to an existing ceiling using thin-set mortar, or fasten directly to the stud frame structure if no ceiling is currently in place. The KERDI-BOARD will protect the ceiling from both water and vapor penetration. 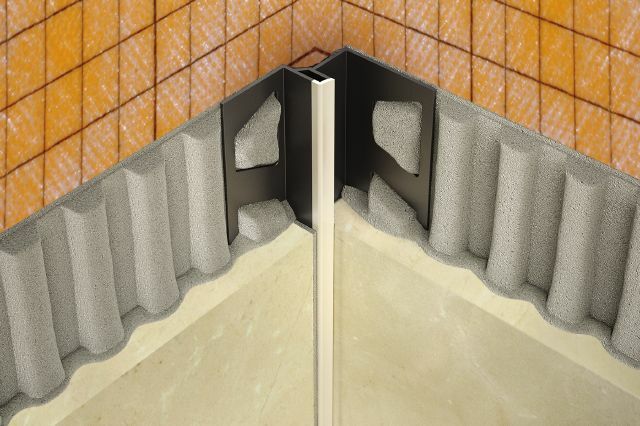 KERDI-BAND is applied to all KERDI-BOARD seams and fastener penetrations, as well as make the connection between the KERDI waterproofing membrane in the floor, and the KERDI-BOARD panels on the walls. KERDI-KERECK-F are preformed, seamless corners made of KERDI for waterproofing inside and outside corners. Corners tend to be challenging areas to waterproof, so these greatly simplify installation. Any protrusions through the KERDI-BOARD (e.g., showerhead, mixing valve, steam inlet, etc.) must be treated with KERDI-SEAL-PS/-MV seals to protect moisture sensitive building materials. As an alternative, KERDI-FIX, or suitable sealant, may also be used. 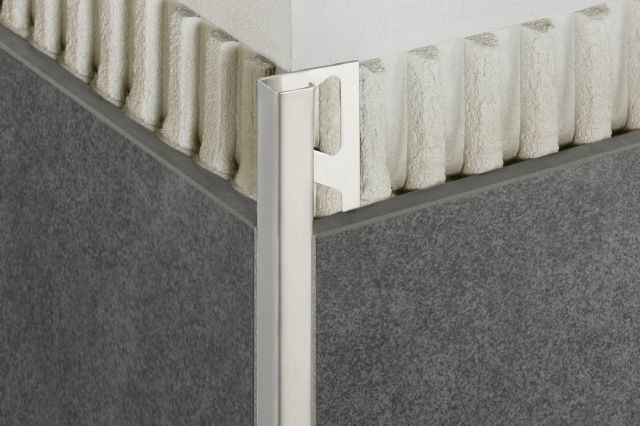 KERDI-DRAIN is installed on top of the shower tray or mortar bed, and features an integrated bonding flange that ensures a secure connection to the KERDI membrane at the top of the assembly. The drain also features a fully adjustable, square grate assembly to simplify tile layout and installation. KERDI-LINE Another perfect drainage option for your steam shower is the KERDI-LINE linear drain. Prefabricated shower trays eliminate the need to build a mortar base, making installation faster and easier. They are made of lightweight expanded polystyrene, and perfectly sloped towards the drain. The KERDI-SHOWER-T/-TS/-TT shower tray is specifically designed to integrate with the KERDI-DRAIN, while the KERDI-SHOWER-LT/-LTS tray is designed for use with the KERDI-LINE linear floor drain. Both are available in a variety of sizes and drain positions, and can be cut to size or extended using dry-pack mortar. 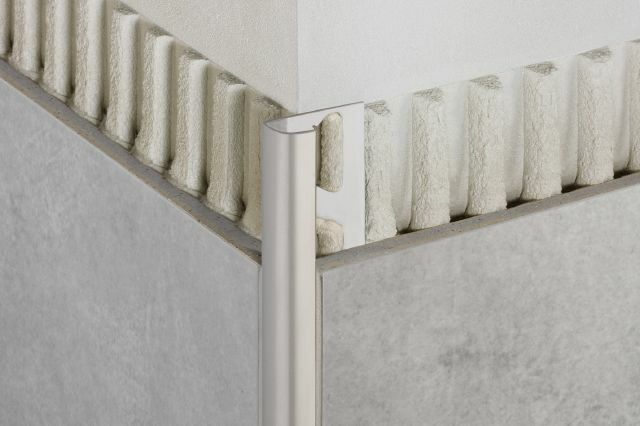 The KERDI-BOARD-SC shower curb featured here is one element of the full line of prefabricated substrates available that are lightweight, waterproof, and ready to tile. 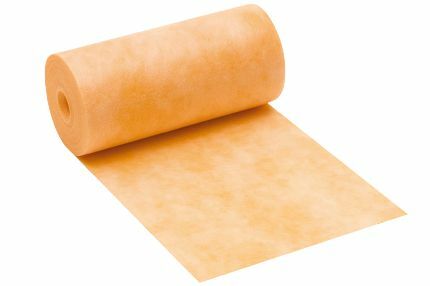 The KERDI waterproofing membrane is suitable for use in residential or intermittent-use steam showers and should be applied to wall, ceiling, and floor surfaces to prevent moisture penetration. 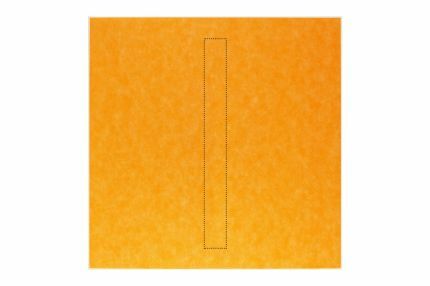 KERDI is 8-mil thick and has a water vapor permeance of 0.90 perms when tested according to ASTM E96, using procedure E at 90% relative humidity. Unlike shower pan liners in conventional assemblies, bonded waterproofing membranes, such as KERDI, are applied directly to the mortar bed and protect it from becoming saturated with regular use. KERDI guarantees uniform thickness, and combines both waterproofing and protection from vapor for effective moisture management in residential steam showers. 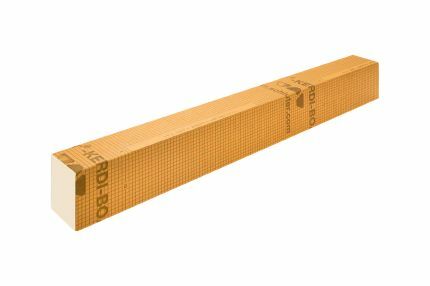 KERDI-BAND is a waterproofing strip used to seal all KERDI seams, and floor-wall transitions. KERDI-BAND is only 4 one-thousands of an inch (4 mil) -thick, half the thickness of KERDI to limit buildup and ensure a smooth surface for tile installation. 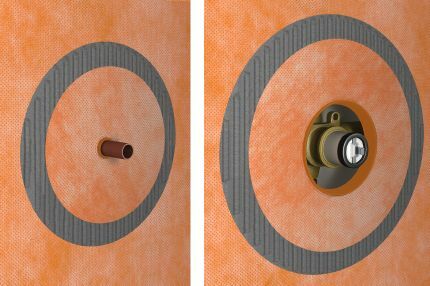 Any protrusions through the KERDI membrane (e.g., showerhead, mixing valve, steam inlet, etc.) must be treated with KERDI-SEAL-PS/-MV seals to protect moisture sensitive building materials behind the tile. As an alternative, KERDI-FIX, or suitable sealant, may also be used. 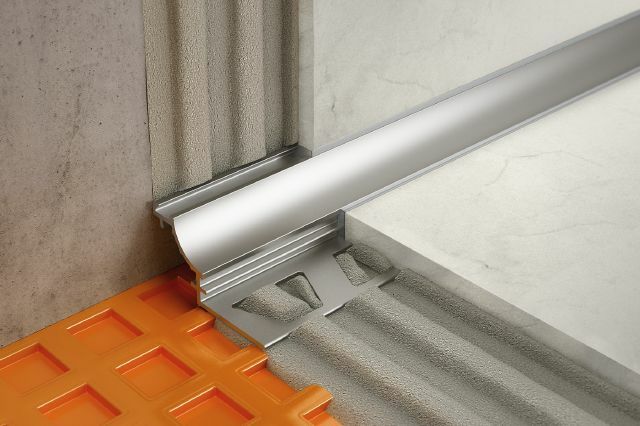 Schluter-KERDI-DRAIN is a floor drain specifically designed to allow connections to KERDI or other load-bearing, bonded waterproof membranes. The membrane is adhered to the large integrated bonding flange to form a waterproof connection at the top of the drain assembly. KERDI-DRAIN consists of a drain casing and fully adjustable grate assembly or covering support to which tile is applied. The grate assembly accommodates a wide range of tile thicknesses and allows lateral and tilt adjustment as well. The covering support is placed flush with the top of the bonding flange and can therefore accommodate any thickness tile covering. For a more elegant, sophisticated look, the KERDI-LINE linear drain is a perfect drainage alternative for the residential steam shower. What’s the difference between a residential and a commercial steam shower? A residential steam shower is one that is used only intermittently, say once a day or every other day. Commercial steam showers on the other hand, like those found at spas, fitness centers, etc., are in continuous use during the hours of operation of the facility, and as such require more strenuous measures to ensure that moisture is effectively managed even in these extreme conditions. Find out how to waterproof continuous-use steam showers. Add a tiered shower bench to your steam shower! KERDI-BOARD can be used to create flat, plumb, square, and waterproof benches for steam showers. 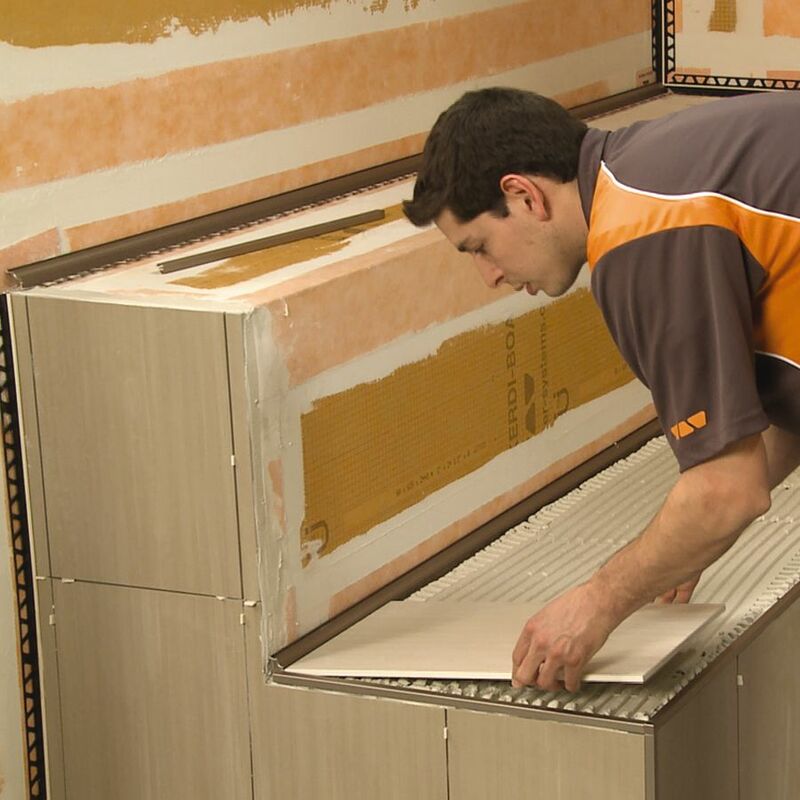 Many of the materials used to build common shower benches, such as wood and gypsum board, are moisture sensitive and require additional waterproofing preparation prior to setting tile. Otherwise, problems such as warping, leaks, and mold growth can occur. KERDI-BOARD is the perfect substrate for building shower benches, and allows for the incorporation of mosaics or large-format tiles. Make sure to seal all bench seams using KERDI-BAND, and all corners using KERDI-KERECK-F. Once this is complete, you’re ready for tile. 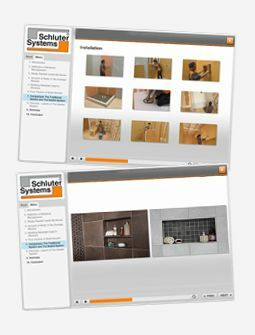 Schluter®-Systems profiles are ideal for residential steam showers and may be used to finish and protect outside corners and eliminate the use of sealant at inside corners.